My resistance coping tactic is to surround myself with Black women. One thing that was re-affirmed to me after November 8 is that if I can’t count on anyone else, I can ALWAYS count on Black women. So since then, I’ve enveloped myself in a blanket woven by the love of sisters. Sisters. From blood to bond. A couple of weeks ago, I was at the Black Enterprise Women of Power Conference, and I got to do one of those things that I imagine Oprah does every Tuesday in her amazing backyard, after she picks her own vegetables and pow wows with Gayle. I hosted a dinner under the stars, where 20 powerful Black women broke bread, cried a little and laughed a lot. 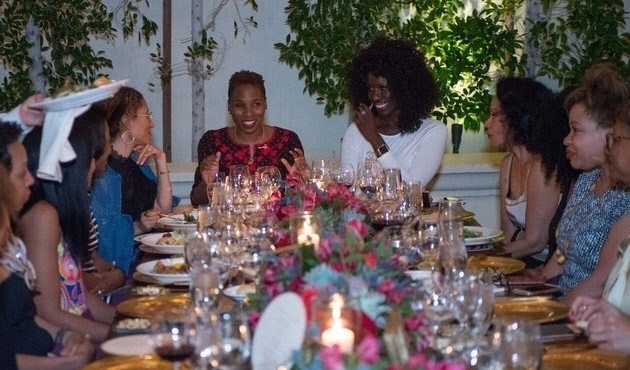 I partnered with the good folks of AT&T for “A Seat at Luvvie’s Table,” an intimate dinner where I invited women who I’d just love to share time with. Honestly, it blew my mind. It’s one of those things where in the moment, you know that you are living in divine favor. The entire 2 hours was one big “wow, this is my life.” A few weeks before it happened, the team at AT&T called me and asked me what I would want to happen at a dinner party I would throw for my girls at my house. What would I want to serve? What conversation would I want to see happen? What feeling I’d want people to walk away with? My answers to those questions were more than duly noted, because everything I said, they made happen. So on Friday evening at the BE WOP Conference, I walked to the private patio restaurant in the Arizona Grand Resort and my jaw dropped. There was a table in the middle, where roses covered the center, and there were gold place settings in front of 20 chairs that surrounded it. Every chair had a gift bag on it. In each gift bag was a copy of my book I’m Judging You, a t-shirt with that phrase on it, a JudgeyPin, and a Blerd t-shirt. There was a custom menu, where each course was named after something related to me or my book. On that menu? Seafood paella and jollof rice. Dessert? Red velvet cupcakes with cream cheese frosting. All of this was surrounded by walls of greenery, and the sun was just setting as the temperature “cooled” to 78 degrees. It. Was. Perfect. I legit wanted to cry. IT WAS SO ROMANTIC. I was wearing a black and red kaftan that I got made in Nigeria, and red glitter TOMS. I took a picture at the end of the table, and uploaded it to social media and people showed it so much love. They called it my Oprah moment. Then I realized that kaftan was what I was wearing when I met Oprah last year. BRUH. I’m telling you. Perfect. My guests arrived between 7 and 7:15pm. Everyone had a name card, which were placed in gold frames around the table and as they sat down, my heart was bursting in glee. Everyone I invited showed up. Every one of these incredible women I wanted to be there was there. I was sitting in between Bozoma Saint John (Head of Global Marketing for Apple Music) and Elaine Welteroth (Editor in Chief of Teen Vogue). Next to Boz was Debra Martin Chase. If her name doesn’t ring a bell, it’s because she’s a real G who moves in silence. Real G as in SHE gave Shonda Rhimes her first internship in TV. And she was the producer of that “Cinderella” with Whitney and Brandy. Across the table was Nina Shaw, the attorney who represents THE BEST talent in Hollywood, including Ava DuVernay and Lupita Nyong’o. Across from me, on the other end of the table was Cynt Marshall, who heads AT&T’s global diversity initiatives. Then there was Richelle Parham, formerly Chief Marketing Officer at eBay. Morgan Debaun (CEO of Blavity), Sandra Sims-Williams (Chief Diversity Officer at Publicis Groupe), Necole Kane, Dee C. Marshall. I MEAN this table was heavy! But most importantly, it was filled with openness and love, which was kicked off with prayer. We talked about our superpowers, our struggles and our triumphs. We talked about how difficult the climb to the top can be and how lonely it can be to be there. Many of us at the table are often the “only” in the room. We talked about how we are committed to making sure that changed. Although the food was good, I was mostly fed by the strength of these women and their companionship. I was inspired by their journeys and I was enchanted by their goodness. These women owed me nothing, but they gave me plenty. Their time, their stories, their truth. I am so thankful to them. Originally appeared on Huffington Post.